Before we move ahead let us first understand the meaning of brown rice. Most of us eat rice that is quite white in color, this is known as polished rice. Another name for brown rice is unpolished rice, this type of rice is believed to bring a lot of benefits for those who eat it. A rice seed when it arrives from a rice farm has an outer brownish layer that is referred to as husk. This layer is quite dry and stiff and cannot be eaten. So all the rice that is eaten on this planet would have the husk layer removed. Under this layer is a reddish brown thin skin (bran) that hugs the rice seed. When you say brown rice, the process ends with the removing of the outer husk, the thin skin remains. If you need white rice, one more process will need to be performed on the rice seed. This process is referred to as 'polishing' and once completed imparts a white color to the rice. So you now understand the meaning of white rice and brown rice. Let us now move ahead to talk about the benefits of brown unpolished rice. The benefits of eating brown rice are many. Most of the health benefits attributed to brown rice are scientifically proven and are not just a folk lore. When you leave the thin brown layer on the rice seed, you are actually retaining fibre on the seed. Fibre in your diet does a lot of good things to your health and you should always, make a concious effort to get sufficient fibre in your meals. Medical tests have proved that consuming brown rice helps reduce the body's sugar and cholestrol levels. Do this on a regular basis and you will surely reap the benefits. Excess sugar and cholestrol in the body can cause havoc with your health. A diabetic condition can further complicate issues so start taking care of your health right now. If you are a new comer to the unpolished rice diet, here is something for you. To start with, we would suggest that you mix half volume of white (polished) rice with half volume of brown (unpolished) rice. We have explained how to cook brown rice in the next few paragraphs. But if you plan to mix white rice and brown rice, remember that the 20-30 minute soaking time for brown rice is not relevant for the white rice. So soak the brown rice for 30 mins and then add the white rice to the soaked brown rice. In the next few paragraphs we explain some very important issues related to brown rice. If you ever wondered why cooked brown rice often appears to be quite hard or what the benefits of eating unpolished rice are, we have answers for you. People often believe that brown rice has a shorter shelf life, this is very true and the paragraphs that follow will tell you why. We also explain in a simple and uncomplicated way how to cook brown rice. As news of the benefits of eating brown rice spreads, the demand for this type of rise has sown a steady increase. At the same time many people who would like to get into the habit of brown rice, do not know how to cook brown rice. Basically the way to cook brown rice does not differ widely from the way that you would cool white rice. One important thing about brown rice is that, it tends to be a little stiffer than conventional white rice. This needs to be kept in mind when cooking brown rice. When cooking brown rice, add the rice and water and let the rice soak in the water for about 20 to 30 minutes. Use this timing as a test factor, you might want to adjust this time based on your presonal preference. The proportion of rice to water when cooking unpolished rice is, 2 parts of water to 1 part of rice. Once the rice has soaked for the above time, turn on the flame and get the rice to cook. The cooking process now remains the same for brown rice and white rice. Once cooked you will notice that, brown rice retains it's form and does not become very soft and sticy like white rice does. People often have a question related to the storage of brown rice. It is important to understand that brown rice has the outer (bran) layer intact. The bran layer also contains some oils, you might have heard of rice bran oil. If you store brown rice for too long, the oils can go rancid and spoil the flavor of the brown unpolished rice. For this reason do not buy too much of unpolished rice at a time. Have a good look at the manufacturing and expiry dates on the packet before buying it. The time left to expiry should be counted from the stamped manufactured date and not from the date that you purchased the packet. We have come across some interesting variations for using brown rice in various food products. A reputed company in Thailand manufacturing bakery products like bread, cookies and cakes has found a unique way to incorporate unpolished rice into peoples diets. They use 30% content of brown rice to prepare a special type of bread. This would mean that the normal bread flour used would comprise just 70% of the dough. This product seems to be doing very well and is charged at a premium. You might have heard of Thai boiled rice soup, it is a soup made from rice that has a lot of water and a small proportion of rice. Meat balls or pieces of fish are often added to this. Some restaurants offer the Thai boiled rice dish where brown rice is used instead of white rice. Men love to wear green gems, they are however particular about the shade of green that they wear. Tourmaline is a spectacular gem found in many colors. 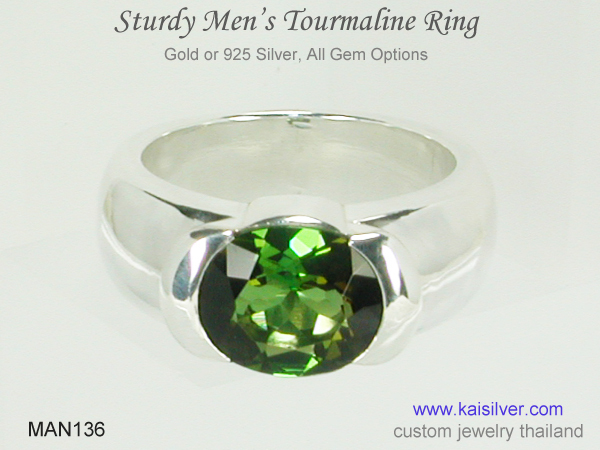 The green tourmaline men's ring shown here is tough and handsome ... more. Pendants are more convenient to wear as compared to rings, they also undergo a lower degree of wear and tear. 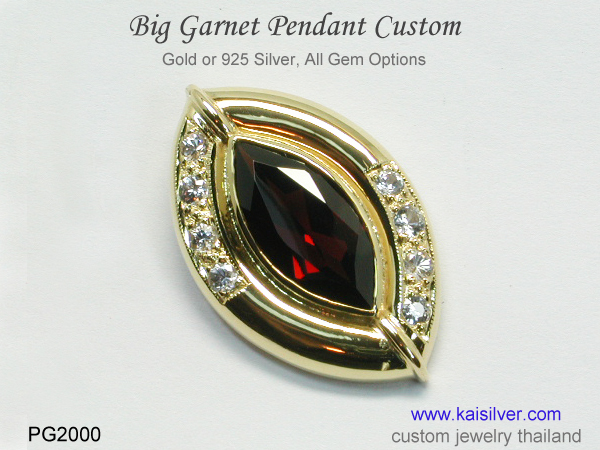 Pendants come in various styles and sizes, you can make a pick based on your budget and personal preference ... more.